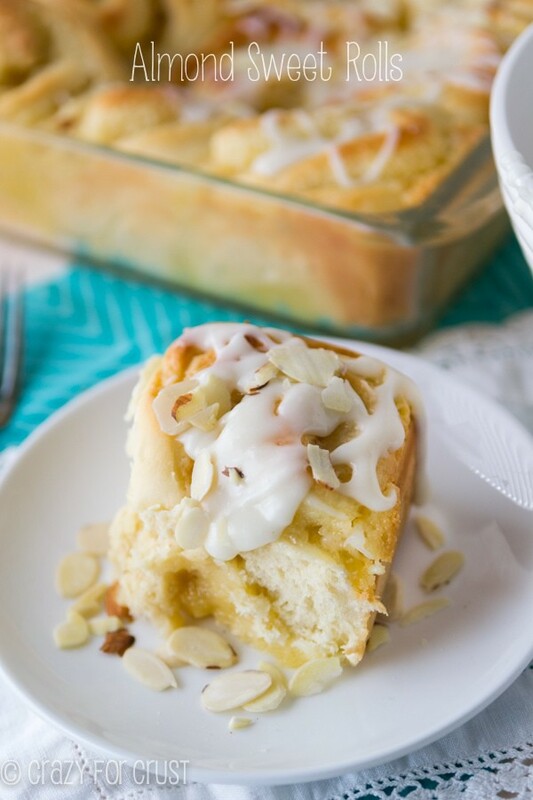 Almond Sweet Rolls – I love almond. Almond croissants, almond scones, almond frosting, almond extract. I can never get enough. These Almond Sweet Rolls take my addiction to a new level. There like eating an almond croissant…in sweet roll dough! We live almost exactly 2 hours from my parents and we drive down often to visit. Exactly halfway into the drive is a Peet’s coffee, off of I-80 in Fairfield. I always look forward to stopping at Peet’s because they have the best almond croissants, bear claws, and scones. It’s a sad, sad day when we get there and they’re out of them. Those suckers go fast. Almond is popular, yo’. Now I don’t have to wait to go to Peet’s to get my almond danish fix. I can make these Almond Sweet Rolls at home, and all will be right with the world. Anyone who is a lover of almond flavor like me (if the extract tasted like it smelled I’d drink it) knows how good almond paste is. 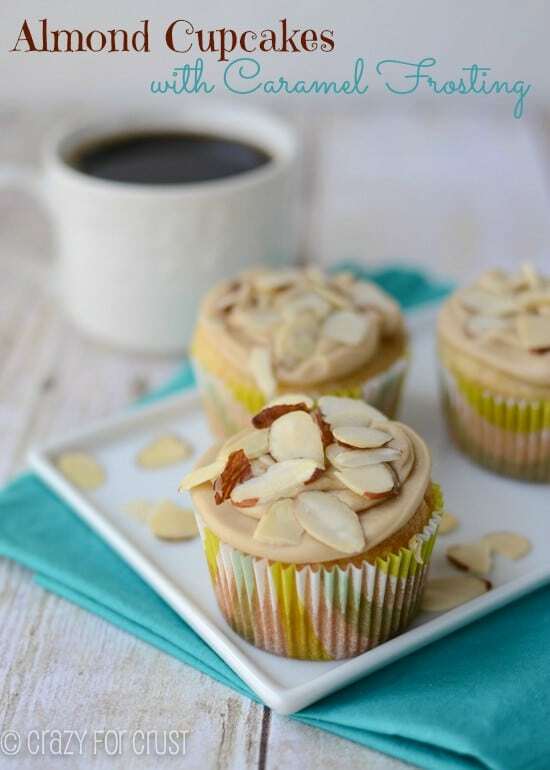 Almond paste is made from almonds and sugar (and sometimes other ingredients like extracts and egg whites) that are ground together into a paste. It adds great flavor to all sorts of recipes, and is often the filling for many almond flavored breakfast pastries. I used a packaged almond paste for this recipe. You can buy it in the baking aisle near the baking chocolates and that sort of thing. It’s usually high on a shelf because hardly anyone buys it, and it’s pricey…but so worth it. You can make your own, and that’s on my to-do list (simply google “almond paste” and you’ll find a million recipes). I decided to make an almond paste filling for my favorite cinnamon roll recipe. I added an entire 7oz tube of almond paste to these rolls, which made them slap you in the face with almond flavor. Packaged almond paste is kind of hard (almost like marzipan candy) so the easiest way to make a smooth filling is by using the food processor. If you don’t have a food processor, I suggest you break or cut the paste into small bits, then use a mixer to incorporate the egg and sugar. You want to avoid lumps as much as possible in your filling. And, well. No almond sweet roll is complete without an almond flavored glaze. 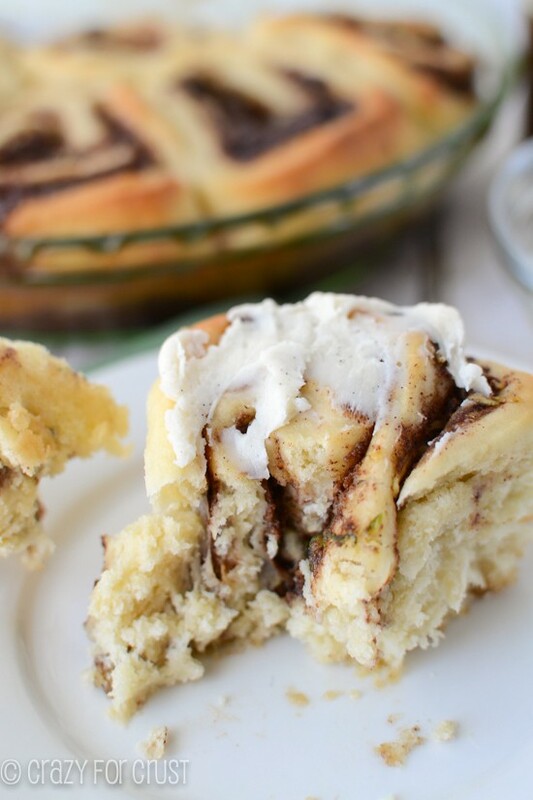 You can use your favorite cinnamon roll dough for this recipe, or you can even use a packaged dough. I just love this butter rich egg yeasted dough, and I’ve made it so many times. It’s fluffy and perfect, and I know you’ll love it. And don’t be afraid of yeast. When proofing your yeast, you can use a thermometer if you have one to test the milk temperature. Or, just think “hot bathwater”. That’s what I do. The yeast doesn’t get super frothy and bubbly before it gets added to the butter and egg mixture, but it does bloom slightly. One of my favorite things about this Almond Sweet Rolls recipe (besides the almonds, of course) is that it can be done ahead of time. Who wants to get up at 3am and make breakfast? 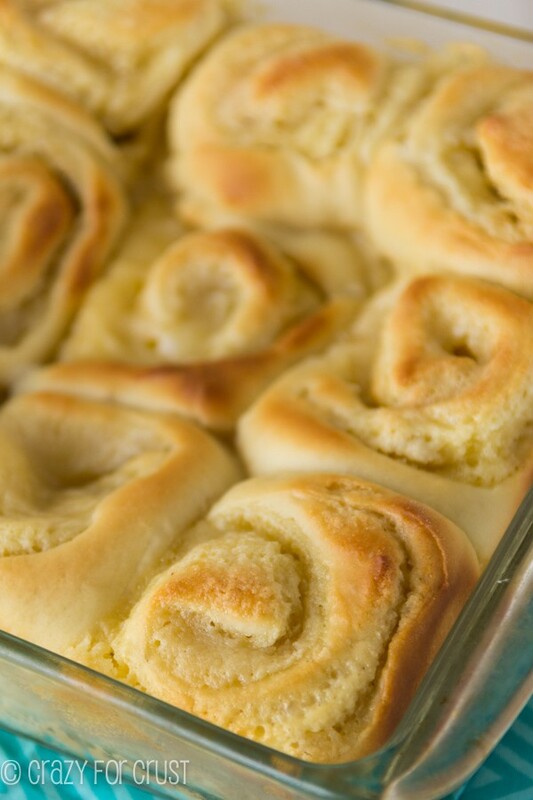 #notme I make the dough and the rolls the afternoon before, then put them in the pan and refrigerate overnight. The next morning, let the Almond Sweet Rolls warm up on the stovetop while you’re preheating the oven. That’s as much work as my morning brain can do pre-coffee. This Almond Sweet Rolls recipe makes 9 large rolls (who doesn’t want a really large sweet roll???) or 12 smaller ones. Make sure you use the right size pan (as indicated in the recipe). 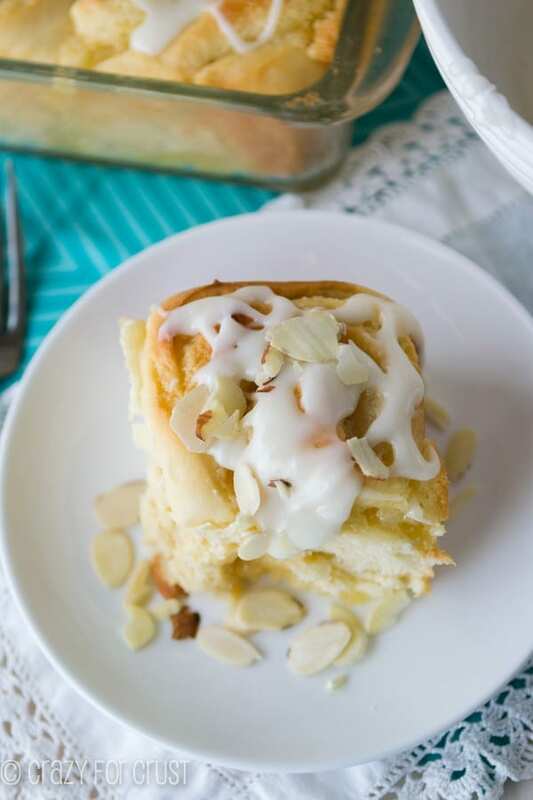 Make these Almond Sweet Rolls for Mother’s Day or a random Tuesday, and you’ll hear the almond angels sing too. Waaaaay better than anything at a coffee shop. I promise! Place milk in a microwave safe measuring cup. Heat for 30-45 seconds in the microwave, until it’s about 120°F (use a thermometer if you have one or think hot bathwater when feeling it. Add yeast and 1/2 teaspoon of sugar and stir. Let it sit for a few minutes to proof. Place 1/3 cup sugar, butter, salt, and egg in the bowl of a stand mixer fitted with the paddle attachment. Mix until the butter is distributed throughout the liquids, although it may be chunky. Pour in the milk/yeast mixture and stir for a few seconds. Add flour and stir with the paddle attachment just until the mixture starts to stick to the paddle. Then replace the paddle with the dough hook. Continue mixing on low speed until the dough forms a ball in the center of the bowl. The dough should be in one piece and it will be slightly sticky, but you should be able to handle it without getting too much dough on your fingers. If it’s really wet, add up to 1/2 cup more flour (but add it 1/4 cup at a time). I always use 3 cups, but depending on the temperature in your kitchen and where you live, you may need a little more. Spray a large bowl with cooking spray and place the dough ball in it. Spray the top of the dough ball with cooking spray (lightly) and cover the bowl with plastic wrap. Let sit for 1-2 hours until it doubles in size. Note on rising: if your house is warm, it should rise no problem. If it’s cold in your house, it may take longer for the dough to rise, so plan accordingly! When the dough has risen, turn it out onto a cutting board that has been lightly dusted with flour. Roll it into a rectangle that’s about 10x14”. Spread the filling on the dough and tightly roll it up. 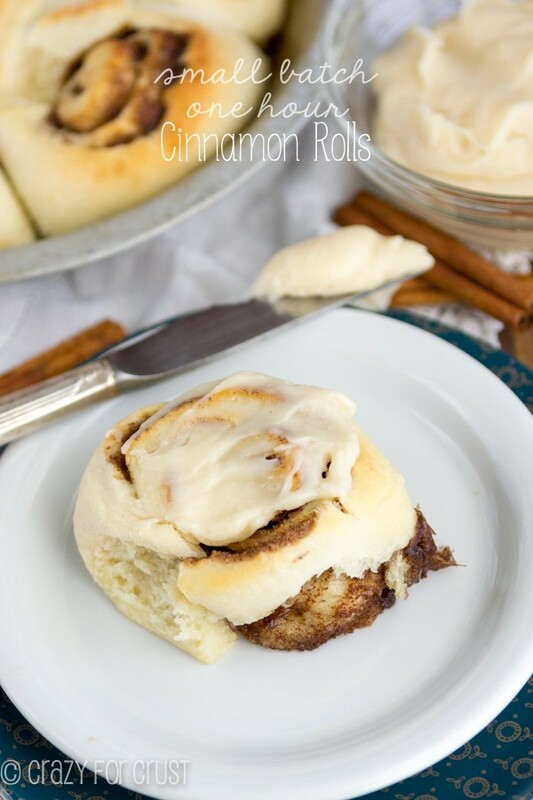 Using a serrated knife, cut the dough into 9 large cinnamon rolls or 12 smaller. For 9 rolls, use a 9” square pan. For 12 rolls, use a 9x13” pan. Spray your pan with cooking spray and place the rolls gently in the pan. You have two options now. 1. Let the dough rise for 30 minutes, then bake as directed below or 2. Cover with plastic wrap and refrigerate overnight, then remove the rolls from the refrigerator and let come to room temperature in the morning while the oven is preheating. Preheat oven to 350°F. Bake rolls for 25-35 minutes, until they’re golden brown on the top. Let cool at least 15 minutes before frosting and serving. Make frosting: whisk melted butter, powdered sugar, and almond extract until smooth. Add 1 tablespoon of milk and whisk until smooth. If the glaze is too thick for your liking, you can add up to 1 more tablespoon of milk. (The pictured rolls use 1 tablespoon.) Garnish with sliced almonds. Made this for breakfast with the make ahead option. It was delicious. I did make my own almond filling, by using ground up almonds, sugar, egg whites, and almond extract. Thanks for a great recipe! I love the almond flavor of these rolls. The recipe worked great for me, and I used the make ahead option. It took about one hour for the rolls to warm up in my kitchen and complete the second rise. Everyone loved this recipe!